If ever there was someone to dispel the myth of the “dumb jock” it was Joaquin Gonzalez. The Miami native left Christopher Columbus High School with numerous athletic and scholarship honors in hand, and would prove at the Coral Gables campus that “student- athlete” is not an oxymoron. Gonzalez emerged from 1998 pre- season camp as a redshirt freshman to start every game at right tackle, becoming just the third freshman in the 1990’s to start along UM’s offensive front, joining All-Americans and UMSHoF members KC Jones and Richard Mercier. He would earn freshman All-American honors and was the only offensive lineman in Big East history to be named Rookie of the Year. He earned All-American honors in 2000 as a junior from the Football Writer’s Association of America (FWAA) and again in 2001. That year, he and UMSHoF member Bryant McKinnie anchored the offensive line that helped Miami to its fifth National Championship. A four-year starter, he set a then-school record with his 49th consecutive start in the Rose Bowl game against Nebraska. Joaquin was named the winner of the Vincent DePaul Draddy Award (now known as the William V. Campbell Trophy), given by the National Football Foundation to the “American college football player with the best combination of Academics, Community Service and On Field Performance.” It is considered the “Academic Heisman.” He was a four-time Big East All-Academic team member and was twice named to the CoSIDA Academic All-American team. Joaquin was tapped into Iron Arrow, “The highest honor one can attain at the University,” as well as Omicron Delta Kappa. He has a B.S. 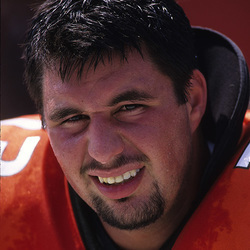 in Business Administration and an MBA in Marketing from The U. Gonzalez was a three-time recipient of the Mariutto Family Scholar Athlete of the Year award (1998, 2000, 2001) and was the 1999 Walter Kichefski Endowed Football Scholarship winner, given annually by the UM Sports Hall of Fame.